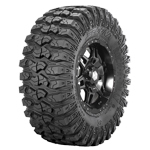 The Sedona Rock A Billy radial tire has been designed to match the high-horsepower, high-speed requirements of today's UTV's and ATV's. It's tread design with integrated side lugs assist with the ability to grip in the extreme riding conditions. The Rock-A-Billy has a bead-to-bead layer of puncture resistant material that makes this 8 ply rated tire outlast, out-grip and out-perform the competition.